This Challenge is going to be released SOON - today still? 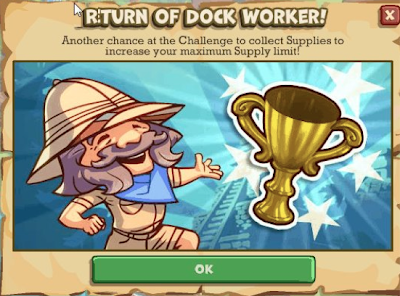 Gather as many supplies as you can in the Dock Worker challenge. Previous challenge was 7 days. The ultimate goal is worth it, if you didn't get the last time or if for the reason of the new game account you lost it (I did) - increasing your maximum Supply limit. Maybe this new return will bring has new surprises.